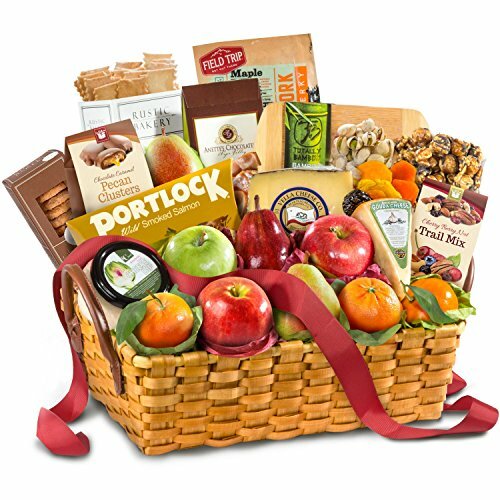 This abundant fruit and gourmet basket is brimming with fresh fruit and gourmet delights. There's plenty to share with orchard favorite Comice and red pears, mandarins, granny smith and braeburn apples, assorted dried fruit, Vella Romanello cheese, mild gouda cheese, salt chocolate caramel pecan clusters, Anette's triple nut bourbon brittle, dark chocolate sea salt caramel corn, olive oil & sel gris flatbread crackers, pecan cookies, maple BBQ jerky, artichoke cheese dip, wild smoked salmon and a bamboo cutting board, all are presented in a reusable basket with handles. Gift is delivered tied with a ribbon. A generous basket overflowing with fresh fruit includes orchard favorites such as Comice pears, apples, and easy-to-peel mandarins. Fruit pairs perfectly with two California cheeses. Plenty of savory snacks including salt and pepper pistachios, cherry berry and nut trail mix, Maple BBQ Beef Jerky, artichoke cheese dip, olive oil flat bread crackers and salmon. Satisfy a sweet tooth with favorites like pecan cookies, dark chocolate sea salt caramel corn, handmade caramel chocolate pecan clusters and award-winning Anette's Triple Nut Bourbon Brittle. Beautifully presented in woven basket with handles, and hand-tied with gift ribbon.